Birder Ray Duffy visits the Meadowlands’ parks and marshes regularly. His recent sightings include a peregrine falcon and an Egyptian goose at Mill Creek Marsh in Secaucus and a least bittern and a willow flycatcher at the Kearny Marsh. 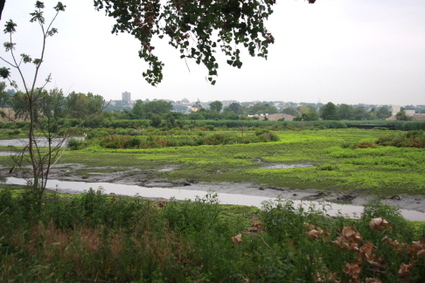 We’d like to think that Pleasantview Terrace in Ridgefield was named for the view of Skeetkill Creek Marsh, a nice natural oasis amid a commercial district. This 16-acre marsh was once all phragmites, and heavily littered. The Meadowlands Commission overhauled the site a decade ago, creating tidal channels, open water, and islands of vegetation. It is now owned by the Meadowlands Conservation Trust. Local volunteers, with the help of a nearby Ridgefield business that has adopted the site, keep the site clean. The Riverkeeper has done clean-ups here as well. Peeps and other shorebirds love Skeetkill Creek Marsh at low tide, and egrets and great blue herons fly in to feed as the tide rises. Click "Continue reading" for more images and information.